After months of speculation, the Nexus 6 was finally announced in October. The new phablet is Google’s first and will be featured alongside its Nexus 5 to offer a choice of smartphones in time for the holiday season. Here’s the full scoop on what we know about Google’s upcoming phablet. Updated on 3-11-2015 by Kyle Wiggers: Added Verizon availability and pricing information. How much will it cost and where can you get it? Price is everything for those who want to buy a Nexus device directly from Google’s Play Store, and the Nexus 6 will cost a pretty penny. The 32GB model costs $650, almost double the current price of the Nexus 5. This high price is certainly consistent with devices featuring similar hardware, but far higher than most Nexus devices. It’s likely this phone will also find its way to carriers, who will help by either bringing the price down or offer financing. Verizon’s an undoubted latecomer to the Nexus 6 party, as all the other carriers have had it since last year, but Big Red finally announced it will begin carrying the handset online starting March 12 and in stores on March 19. It’ll retail for $250 with a new two-year contract or $27.08 per month for 24 months with Verizon Edge. Purchasing before the month is out will net 6 free months of Google Play Music. You can check out the info and pricing on Verizon’s website. T-Mobile delayed the Nexus 6 launch, pushing it back to November 19. It was originally supposed to launch one week earlier at the Uncarrier, but limited supplies may have forced T-Mobile to postpone the phone’s release in stores. On the company’s website, the Nexus 6 was listed as “coming soon,” but now it’s available for order. You can get the Nexus 6 for $0 down and payments of $27.08 a month for 24 months. The full retail price is $650 and you can check out all the info on T-Mobile’s site. AT&T is also offering a great promotion to those who pre-order a Nexus 6 for $0 on its Next plans. Those who choose this option get $50 off of a Moto 360, Moto Hint, or Moto Sliver II. You can see all the details on AT&T’s website. If Sprint is the network for you, then starting Friday, November 14, Easy Pay subscribers can buy a Nexus 6 for $0 down and 24 monthly payments of $30. Featuring a 5.96-inch QHD display, the Nexus 6 is Google’s largest smartphone yet and will be even bigger than both the iPhone 6 Plus and Samsung Galaxy Note 4. Google released a teaser showing just how the Nexus 6 will look from head to toe. If it looks familiar at all, you’re not mistaken – the Nexus 6 is built by Motorola and borrows a lot of its design from the new Moto X; it’s just bigger. 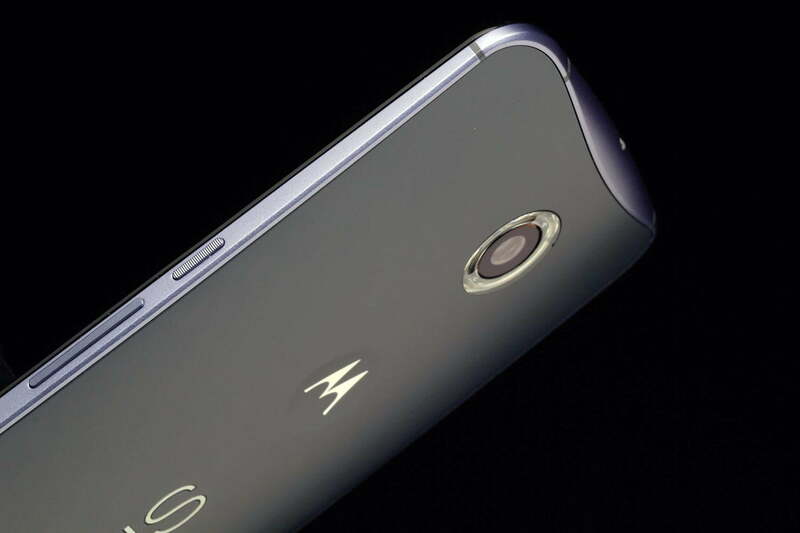 It also has, like the Moto X, rounded edges, what appears to be a metal frame, and front-facing speakers. So far we’ve only seen the Nexus 6 in two colors: Black or white. Under the screen, the Nexus 6 will be powered by a 2.7GHz Qualcomm Snapdragon 805 processor, along with 3GB of RAM, meaning plenty of processing power when you need it with this phablet. Users can get either 32GB or 64GB of internal storage in the device, though there’s no sight of a MicroSD slot on the device. If you like taking photos, the Nexus 6 will come with a 13-megapixel camera on the back an 2-megapixel camera on the front. More importantly, the rear camera also features optical image stablization (OIS) so you won’t get shaky photos trying to hold the huge phone. The Galaxy Note 4 has a slightly bigger camera on the front and back, while the iPhone 6 Plus has only a 8-megapixel camera. All three devices feature OIS. To power everything, the Nexus 6 will get a 3220mAh battery, which is the same battery size we saw with the Galaxy Note 4. Morotola’s Turbo Charge technology will also be in the Nexus 6, allowing users to quickly pump their battery back to life before heading out. Apparently a 15-minute charge will give users up to 6 hours of additional use, which is impressive. All in all, Google pulled out all the stops for its new flagship smartphone of 2014. Google has been building hype around its next generation of Android, codenamed Android L, since Google I/O in July. Android L is coming to the Nexus 6, and the official name, Lollipop, has also been announced. For the Nexus 6, Android Lollipop will blend in a new, beautiful, and streamlined Android experience all viewed from its high-resolution display. Google has shown off several highlights from Android Lollipop on the Nexus 6, including its new multitasking, personalization settings, and “material” design style for its apps. Like all Nexus devices, the experience will be focused on providing a minimalist experience, highlighting Android 5.0’s looks and capabilities as opposed to using third-party software. These days, Android on its own is looking better than ever. The Nexus 5, released about a year ago, will continue to be sold alongside the new Nexus 5 and Nexus 6. Google has also confirmed support for Android Lollipop for the smartphone, which launched October 2013. A developer preview of Android Lollipop for the Nexus 5 will be available starting Friday, October 17 for those interested in giving it a go. Despite being a year old, there’s no word yet on if the Nexus 5’s price will change once the Nexus 6 goes live in the coming weeks, though it is already much cheaper than the Nexus 6. Updated on 11-21-2014 by Malarie Gokey: Added AT&T recall news after software bug plagues its Nexus 6 handsets. AT&T was forced to pull its Nexus 6 handsets off the shelves, as users reported severe software bugs. The software problem turns the Nexus 6’s screen black and the phone fails to connect to AT&T’s network. Motorola is working on a fix and plans to ship new Nexus 6 phones to the carrier, but in the meantime, AT&T has no Nexus 6 phones in stock. Updated on 11-19-2014 by Malarie Gokey: Added T-Mobile pricing and availability for online orders. Updated on 11-12-2014 by Malarie Gokey: Added T-Mobile statement on Nexus 6 availability. Updated on 11-11-2014 by Malarie Gokey: Added AT&T and Sprint pricing for the Nexus 6.